Philip Sterneveld was born on 04 July 1812 in Zutphen, Gelderland, Netherlands to parents Samuel David Sterneveld, 64, and Rebecca Politz, 21. Philip was the oldest of 7 children between Samuel and Rebecca. Philip had 2 younger brothers (Jacob and Samuel), and 4 younger sisters (Judith, Bettjen, Saartje & Rachel). Of his siblings, we know Judith and Jacob did not survive. Father Samuel was a hostel owner, providing reasonable accommodations to others either passers by or members of the community without a home of their own. On 07 Feb 1823, while Philip was just 10 years old, his father Samuel passed away. While upsetting for Samuel, this wouldn't have been a sudden unforeseen event. Samuel was about 43 years the elder of his wife Rebecca, and approaching the age of 75 when he passed (beyond what would be considered a life "cut short"). On 13 September 1843, at the age of 31, Philip married Sara Spier in Zutphen, Gelderland, Netherlands. The Spier family was a fairly prominent family in the Jewish community in the nearby town of Gendringen. Over the next 16 years the couple would grow their family, welcome a total of 9 children. The started on 05 November 1844 with daughter Betje and continued with five more girls: Aaltje, Jeanette, Mina, Rika and Rebekka; and 3 boys: Samuel, Jacob and Emanuel. On 30 June 1859, for reasons unknown, the Sterneveld family left their home in Zutphen and relocated 130 kilometers south to Krefeld, Germany. It's in Krefeld the following year where the Emanuel, the youngest of the family was born. After Emanuel's birth, the family mostly disappears. 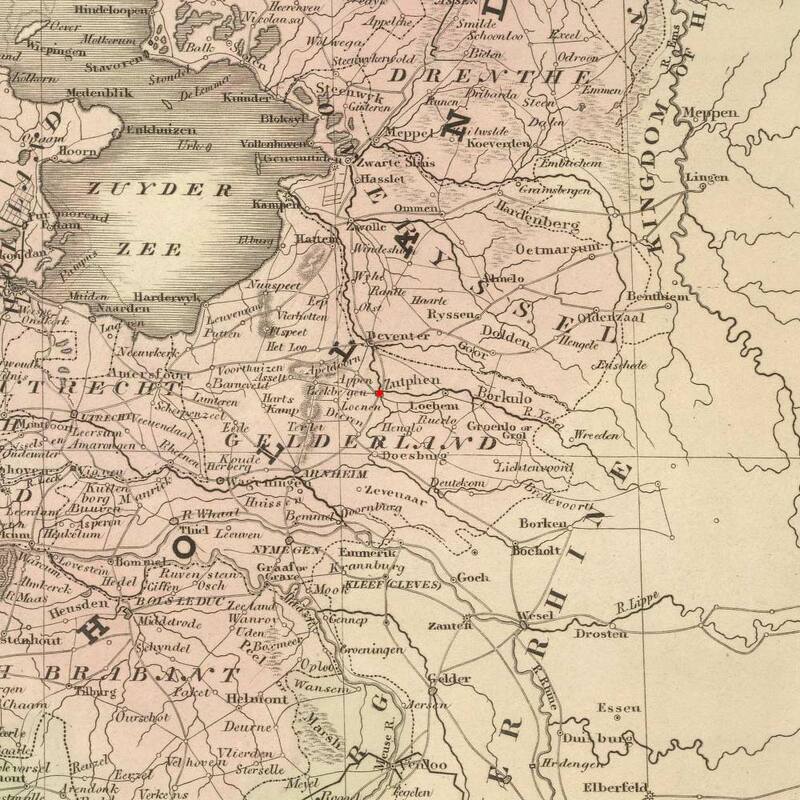 It's only though records from the surrounding area that we find the marriage of daughters Mina (Krefeld, 1879), Rebekka (Amsterdam, 1886) and Rika (Dusseldorf, 1891). We don't know what happened to Philip and Sara after 1860 nor whether they stayed in Krefeld or followed one of their daughters. The family by this point becomes a mystery (Sons Samuel and Jacob immigrated to New York, USA, but Philip and Sara didn't follow). Sara Spier, 28 June 1818 - ? Betje Sterneveld, 5 Nov 1844 – ? Aaltje Sterneveld, 11 Mar 1849 – ? Mina Sterneveld, 11 Sept 1851 - ? Jeanette Sterneveld, 1 Jul 1853 - ? Rebekka Sterneveld, 25 Aug 1858 – ? Emanuel Sterneveld, 20 Aug 1860 – ? A We lose track of the vast majority of the Sterneveld family after 1860 because they move into Germany. The lack of records available online from Germany makes it hard to track ancestors unless you know their exact location down to the town and church they were from. Making it even harder, the family was Jewish, so the majority of their records in Germany (that weren't civil) were destroyed by the Germans. The only family we've been able to track are the daughters that returned to the Netherlands and married there or the 2 sons that immigrated to America. Philip, Sara, and the rest of the children remain a mystery. B It should be noted that daughter Rika's story is tragic. She married Soloman van Bleijdenstijn (also written as Bleijdenberg) in Düsseldorf and lived long enough to be exported to Camp Vught, the Nazi extermination camp, in Vught, Noord-Brabant, Netherlands during World War II. She was murdered 07 May 1943 at the age of 86, along with what was most likely the vast majority of her friends and community. C If there were any record of the Sterneveld family in the scrolls of the Krefeld synagogue, they were lost when the scrolls were stolen in the late 1930's by the Nazi SS who burnt the synagogue to the ground. The Krefeld Cemetery was also desecrated in 1927 making the ability to find if Sterneveld family was buried there impossible. C There is a fairly large discrepancy in the designation of daughter Jeanette. Problem is that she is listed as daughter Jeanette, born 1 Jul 1853 on her civil registration documents in Zutphen, but then the only complete family register (census) in Zutphen has her register as a "him". Jeanette is listed as a son of Philip under the name "Japhet", same date of birth. There is no sign of Jeanette on this record (in case the record documenting twins was missed). What was the cause for the family leaving Zutphen and moving to Krefeld? What happened to Philip, Sara and the rest of the Sterneveld family after their immigration into Germany? Children eventually dispersed to Frankfort and some returned to the Netherlands, but what about Philip & Sara, did they remain in Krefeld? 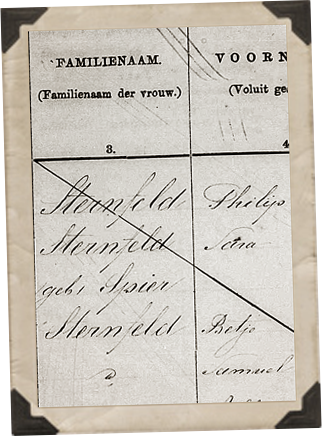 1 Birth of Philip Sterneveld, "Netherlands, Gelderland Province Civil Registration, 1800-1952" database with images, FamilySearch (https://familysearch.org/pal:/MM9.1.1/KTQ3-VGS : accessed 8 December 2014), Philip Sterneveld, 04 Jul 1812; Birth, citing Zutphen, Gelderland, Netherlands; Rijksarchief de Gelderland, Arnhem (Gelders Archive, Arnhem); FHL microfilm 429,684.